Even though Bhadrapur is one of Nepal’s oldest municipalities and well positioned as a trading city, it has a relaxing vibe to it. You will not find the claustrophobic crowds of people and vehicles at Bhadrapur. Instead, the calming allure of its tea gardens, beautiful landscapes and unique cultural experiences find you. The Mechi River separates Nepal from bordering India. 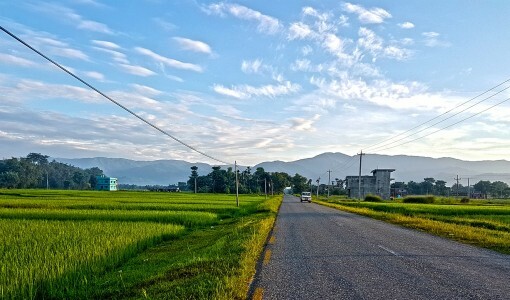 Bhadrapur’s prime location makes it a gateway connection to cities like Siliguri and other northeastern parts of India. It has flourished over the years, and is well facilitated with educational, transportation, communication and other recreational amenities. From Kathmandu, it will take you 10 hours on the road or 40 minutes by flight. Bhadrapur is the starting point for your eastern Himalayan adventures in destinations like Ilam, Panchthar, Taplejung and Pathibhara. Darjeeling is close to the border it is easily accessible from Illam and Siliguri. The distances from both routes are around 100 km which usually takes about 4 hours drive. Include some of the best place to include in your travel bucket list and get the best experience of travelling Bhadrapur. From Bhadrapur, you can easily travel to the neighboring countries of Bangladesh, Bhutan and India. In terms of cultivation, it is the city where cereal crops like paddy, maize, wheat and cash crops like sugarcane and tea are produced. The lowest elevation of the country known as Kanchan Kalan lies in Jhapa district. It lies at an elevation of only 70 meters above sea level. If you get the opportunity to get a window seat on a flight to Bhadrapur, keep your eyes glued to the window as you see mountains scrolling by, including Mount Everest. Among the famous places to visit in Bhadrapur is Kichakbadh and Arjundhara. They are related with Mahabharat as various incident took place here. The pond lying next to the temple is still believed to be filled with water from the hole made by Arjun. Before the day ends, you can also go to Jamunkhadi; a wetlands conservation project in the Kankai municipality of Jhapa. After a long day of exploring, you can relax by fishing or boating on the pond at Jamunkhadi. Famously known as the "tea city of Nepal," it would be a missed opportunity not to try the varieties of orthodox tea in Ilam. The Kanyam Tea Estate alone produces over 125 tonnes of the most exquisite orthodox tea. Acquaint yourself with the locals for their love of tea making and taste varieties of tea like black, green, white, green and Oolong. Ilam is not only about tea. Locally made dairy based items like bambaisan (a sweet treat made by thickening milk by heating and mixing with sugar), cheese and lollipops are favourite souvenirs for locals and tourists. The "Ilam Lollipop" is not the typical lollipop with a stick at the end. Instead, these sweets are made by boiling milk until it is thick. Then, sugar is added until it turns brown. The lollipop is then segmented into different cylindrical lengths and wrapped in colorful wrappers. Other stuffs like Churpi, Akbare Khursani (round chilies), ginger, potatoes, etc are also famous. Try the local markets of Bhadrapur for shopping various items. Fikkal Bazar is located along the Mechi highway on the way to Ilam. Fikkal Bazar is the main market for the local villagers who came here to sell their products and buy new products. It is also popular for its Haat Bazaars that take place weekly, where you can buy directly from local vendors. Hongkong Market is popular for shopping which is located in Siliguri nearby from Bhadrapur. If you come to Siliguri you just cannot miss this place. You can find everything from electronic goods to imported clothing, fancy items, perfumes, shoes, makeup etc. Visit Ilam and take a 2 hours drive from Ilam to Chhipitar will bring you to the foot of Antu Danda, which is 2328 meters tall. You can view the sunrise or sunset over the large tea estates of Ilam from Antu Danda. You can also locate Mount Everest and Mountain Kanchenjunga, the highest peaks of the world. Kanyam and Fikal are other most visited destinations by tourists in Ilam. They are great places to observe landscapes and views of perfectly lined rows of tea gardens. People also come here for picnics and sightseeing. Sandakphu (Sandakpur) and Chhintapu are the highest peaks of Ilam with elevations of 3,636 m and 3,400 m respectively. These places are perfect habitats of Nepal's national flower, the rhododendron, and different species of flora and faunas. Travelers love to visit this place because it provides long range view of mountains from Mt. Everest to Mt. Kanchenjunga. A 30 minutes drive from Ilam will take you to Mai Pokhari, one of the religiously important sites. An annual fair is held every year around October or November at Mai Pokhari, which is considered the abode of Goddess Bhagawati. At Taplejung, located in the hills at the edge of Kanchenjunga Conservation Area, Pathibhara Temple is much revered by those that are spiritual. It takes a day long hike to reach the temple from Taplejung Bazaar that can be reached in a vehicle from Birtamode or take a longer trekking route from Dharan passing through Dhankuta, Hile, Sindha and Basantapur. Siliguri is 25 miles northeast from Bhadrapur. This area takes you to Iskon Temple also known as Sri Sri Radha Madhav Sundar Mandir. This temple was built by ISKCON, which stands for International Society for Krishna Consciousness. Bhadrapur will provide you with adventures like trekking and horse riding through the tea gardens. Kanyam Tea Estate will give you amazing opportunity to horse riding and horse riders will entertain you with their amazing local stories. You can always go trekking to Antu Dada, Sandakpur and Chhintapu. From these places, you can view ranges of famous mountains such as Mt. Everest and Mt. Kanchenjunga. If you want glorious mountain views of the third highest mountain in the world, i.e. 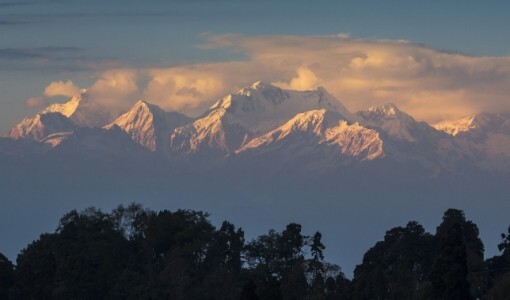 Mt Kanchenjunga, make your way towards Kanchenjunga Conservation Area. Covering an area of over 2,000 square km with variations in altitude from 1,200 m to 8,586m, the best way to get there is via a week's trek from Taplejung. It's not just the mountains that are famous. As it is a conservation area, there are varieties of flora you can find like orchids and rhododendrons, rivers, lakes and glaciers. It's also home to endangered mammals like snow leopards and red pandas. Bhadrapur’s culture is an infused blend from India and Nepal. People in Bhadrapur mostly speak Nepali, and respective ethnic groups speak their mother tongue. Bhadrapur also has its own local radio station to promote its unique local culture. There are three major religions followed in Bhadrapur which are Hinduism, Buddhism and Christianity with greater density of Hindus. The people here are progressive in trade and business. Rice, paddy, maize, wheat, sugarcane, tea, etc. 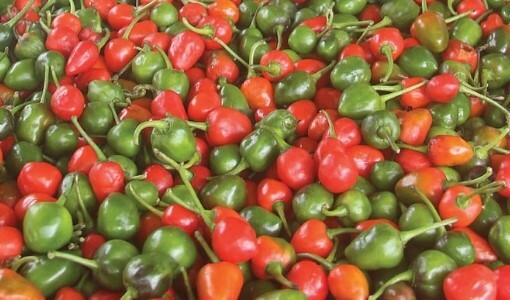 are the main agricultural products. Jhapa has the highest population of Satar (Santhals) in Nepal. Satar are an ethnic minority in Nepal. Satar Nach is a tribal dance performed by Santhals on the occasion of Dashain Mela. We operate daily and direct flights from Kathmandu to Bhadrapur. The flight duration of Bhadrapur flight is 45 minutes. 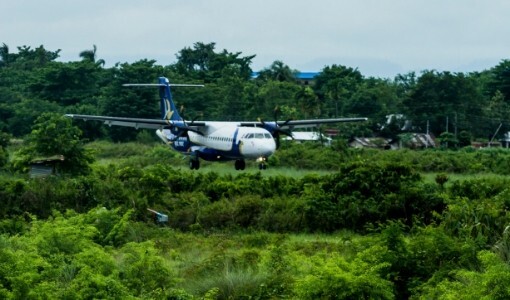 Chandragadi Airport is the domestic airport in Bhadrapur, Jhapa serving daily scheduled flights to Kathmandu. A trip to Bhadrapur is unlike any other you will experience in Nepal. The perfectly lined tea gardens, glorious mountain views and an unforgettable religious trek are memories you will cherish.